Steven Smith joined the elite club of cricketers, who have scored centuries in all Test matches of a series. 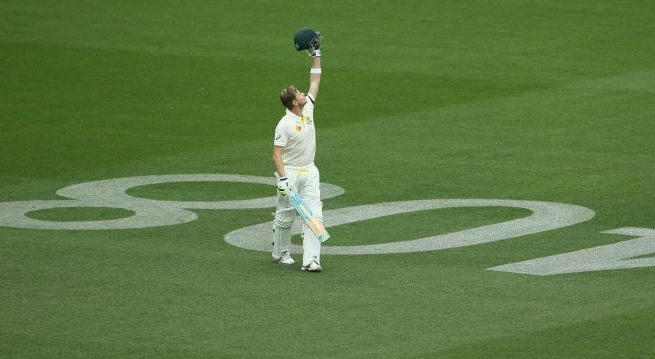 With his fourth successive Test hundred, Steven Smith propelled Australia to a mammoth total of 572/7 declared. He scored 117. Other Australian batsmen, who contributed to the total, were Warner 101, Rogers 95, Watson 81, Shaun Marsh 73 and Joe Burns 58. Mohammed Shami took five wickets. India made a disastrous start by losing Murali Vijay for no runs on board. However, Rohit Sharma and Lokesh Rahul (who opened the innings), batted with patience to take the score to 71/1 at stumps on Day 2. India still need 302 runs more to avoid the follow-on.